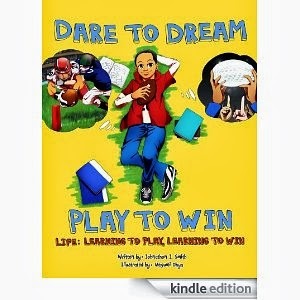 Johnathon Smith's "Dare to Dream, Play to win – Life: Learning to Play, Learning to Win" is an inspirational story about a child who has trouble reading. The main character is nine-year-old Cameron, a huge football fan. Cameron's dream is to be a football star, so much so, that his day dreaming stops him from being able to focus on schoolwork. Cameron ultimately makes some bad decisions in school. Fortunately, he meets a professional football player who inspires him to work hard in everything, including school. The plot is well-paced, and it is wonderful to read about Cameron's growth as a person. The lessons in the story are presented in a way that feels natural and inspirational. There a number of children's books that just "preach" at the reader. This is not the case. The lessons about hard work and honesty, among other things, are integrated into the story perfectly. Children reading this book will be inspired to read more and understand its importance in personal growth. This is a must-read for any child who has trouble getting motivated to read!